There is a type of polyp that may be found in the colon of a person who has inflammatory bowel disease (IBD), either Crohn's disease or ulcerative colitis, that is actually not really a true polyp. These growths are called pseudopolyps because they are not polyps at all; rather, they are "false" polyps. Pseudo means "fake" or "phony," and while the structures themselves are very real, they are not the same type of polyp that is removed because it might cause colon cancer. People with IBD may have inflammation in their colon, which happens during flare-ups of the disease. For some, the inflammation can be severe and can go on for long periods of time. The inflammation leads to actual ulcerations (holes) in the wall of the colon. In ulcerative colitis, those ulcers tend to be confined to the inner wall of the colon, but in Crohn's disease, the ulcers can go deeper into the intestinal wall. The cycle of ulceration and healing results in the creation of scar tissue. This is similar to how a cut on the surface of the skin may cause a scar that looks different than the surrounding, unbroken skin. The scar tissue that forms in the colon when inflammation is present and then heals somewhat resembles polyps, but it is not like the classic polyp that is on a stalk. Pseudopolyps are flatter and look more like a bump. A polyp is a growth inside the colon that can take on various shapes, but almost always carries a risk of developing into colon cancer. For that reason, polyps are removed during a colonoscopy as a matter of routine. Many people over the age of 50 years start to develop polyps, which is why a colonoscopy to screen for colon cancer is done starting at that age. If the polyp is removed, so is the risk of it developing into cancer. Pseudopolyps, however, have no such risk of turning cancerous and therefore do not require removal. Within the colon of someone who has ulcerative colitis or Crohn's disease, there could be various abnormal things happening that a gastroenterologist might call a "finding" or "pathology." 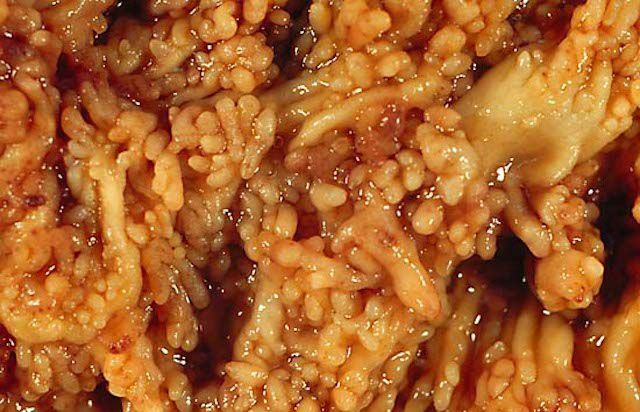 This can include pseudopolyps and polyps, and in Crohn's disease, something called cobblestone sign. Cobblestone sign occurs when parts of the colon look like a cobblestone street because of recurring inflammation and healing, and is a finding only seen as a result of Crohn's disease. A trained and experienced gastroenterologist may know the difference between a polyp or a pseudopolyp on sight, but a biopsy of the area will also be taken, to make sure. A biopsy, which is a sample of tissue, can be taken from inside the colon during a sigmoidoscopy or a colonoscopy. Biopsies will typically be taken from several different areas of the colon and sent to a pathologist for testing in order to determine the diagnosis of any abnormalities that are found. In this way, any polyps or pseudopolyps can be positively identified. The gastroenterologist will want to make absolutely sure that anything resembling a polyp is a pseudopolyp and not a true polyp. There isn't usually any specific treatment needed for pseudopolyps that are a result of Crohn's disease or ulcerative colitis. Typically, it's recommended (as always) that if any inflammation is present from the IBD, treatment​ should be continued or initiated to get it under control. Check with a gastroenterologist if there are questions about pseudopolyps and what they mean for the course of IBD. Pseudopolyps aren't generally a cause for concern, but it could be an indication that too much inflammation has been allowed to continue in the colon. Proper treatment of IBD will mean that inflammation is kept at bay, along with symptoms. Regular visits with a gastroenterologist and the development of an appropriate treatment plan will help keep the IBD under control. Concern over the discovery of pseudopolyps or true polyps in the colon during a colonoscopy should be discusse with a gastroenterologist. D'Haens G, Rutgeerts P. Endoscopy in inflammatory bowel diseases. In: Waye J, Williams C, Rex DK, eds. Colonoscopy. Oxford: Blackwell Publishing. 2004.